First published in The Age on March 13, 1959. THE Shire of Dandenong will be proclaimed a city tomorrow by the Governor Sir Dallas Brooks, at 3 p.m. from the front of the Town Hall. The ancient symbolism of the proclamation ceremony will impress new dignity and importance on a district that has grown from a place of scattered cattle stations and farms to one of the dramatically great industrial centres of modern Victoria. Much of this transformation has come about in less than a decade, and it is not ended yet. Almost daily, new industries find a pleasant, useful home on the plains that spread from the town towards the sea and towards the mountains. With the industries come new homes for the technicians and the work force, and for the shopping centres that feed and clothe them; new means of education and recreation, more amenities of living, health and pleasure, new character to a place grown almost overnight from a small market and stopover village at a creek - crossing, to a bustling, eagerly expansive city. Yet there are contradictions about this city-elect. In the beginning — and for that we must go back to 1835, the year Melbourne was born — the district embraced everything from Oakleigh to the sea, and to the mountains. The Upper Yarra and the Westernport aborigines named it Dan-y-nong (or Tanjenong) when asked by the first travellers, but they pointed to the range of hills north-east from the creek, and the reedy swamps of the plains. The names were too much for European senses, and William Lonsdale, first official representative in Victoria, wrote it as "Dandenong." It meant Big Hills, or Lofty, and was officially applied to several natural features — the hills, the creek running through the plains from the foothills to the sea, and to the village that grew on the banks of the creek. There is a legend that an aborigine finding a bag of lime, and, cooking it, disgustedly declared the concrete "No good damper." The word he is alleged to have used was Dandenong, but there is no substance for that, although there may have been in the legend. A roadside inn named "No Good Damper" stood near Oakleigh for some years from the early 1840's. The loudest lament of the hostess was that she could not keep the kangaroos from her patch of pumpkins and cucumbers. 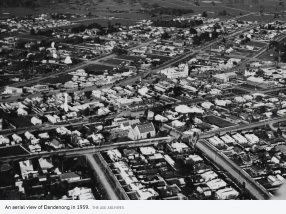 ANOTHER contradiction is that only a small slice of the original shire of Dandenong becomes the city of Dandenong. The rest is now the shire of Spring Vale and Noble Park, created in 1955. Earlier, in 1920, Carrum was cut from the shire of Dandenong to become the borough of Carrum, now a city. 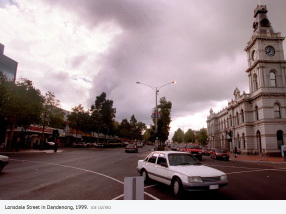 Historically, Dandenong became a district roads board in 1857 and a shire in 1873. At one time it covered 52 square miles. As a city it will embrace 14 square miles. Because of its size, its creation as a city was agreed by special act of Parliament, the maximum area for executive proclamation being nine miles. A third contradiction is that many of the great secondary industries that have made Dandenong's name in the past few years are not actually sited within the boundaries of the municipality, but are in the neighbouring municipalities of Spring Vale and Noble Park, Berwick and Mulgrave. But that takes nothing of glamour from the town that has been known for many years as the gateway to Gippsland. Truly so, as any proud citizen will tell you, for the mountains and their foothills come to Dandenong town on the one side and the flat sea plains on the other, joining exactly at the bridge over the creek, and all roads, railways and other routes to Gippsland from Melbourne, or any other part of Victoria, must pass through the town now to become a city. That was always so, the name being all embracing, and its meaning and value to Gippsland that of a parent and a guide. THE first white man to pass over the creek, herding cattle, was probably John Highett who continued on to "sit down" and founded the suburb that bears his name. Then came the five brothers Huffy, who pastured their cattle in the Dandenong foothills and across to Cranbourne where for a time one of them kept an inn. Joseph Hawdon was the first to "sit down" along the swampy creek. He stayed for a little while, then sold his stock to William Lonsdale, who built a sod hut on the site of Dandenong for his overseer, Alfred Langhorne. That was in 1837. It was the beginning of the village, and the nucleus of the district's development. Soon, the plains and the foothills pastured stock, housed timber getters and paling splitters, and small farms began producing potatoes and other vegetables for the Melbourne market. Among the men who took over all or part of Lonsdale's Waterholes station were Edward Wilson, who became owner of the "Argus" and built its fortunes; Dr. Farquhar McCrae, whose descendants gave Australia some fine writers, poets and artists; John Helder Wedge and his brothers; and Rev. James Clow, the first ordained clergyman to preach a sermon in Melbourne. James Clow was a Scotsman who served some years with the East India Company as their Presbyterian pastor at Bombay. Ill-health compelled retirement and he came to Melbourne in March, 1838. He was at Dandenong from August. 1838. His station was called Corhanwarrabul, from one of the peaks of the Dandenongs Here he pastured cattle and bred horses. MOST courageous of the early Dandenong settlers was Mrs. Madeline Scott. She arrived in Melbourne with her husband, Alexander Scott, and young family in 1839, and a few months later they took over a cattle run on the western side of the creek. Before they could occupy it Scott died. His widow trekked to the station with her youngsters, and carried it on for some years. The station was in thick timber, and Mrs. Scott hired timber cutters and sawyers to fell trees and cut them into building slabs, sleepers, palings and paving blocks. The gold rushes passed Dandenong by; development was quiet, slow. Large holdings became farms for dairying and crops. In 1884, with its population 300, the town became a market for Gippsland stock. The first market was capable of holding 100 head of cattle, 100 sheep, and had four yards for pigs. Its revenue 10 years later, when the shire took control, was £112. Today, Dandenong's dairy cattle market is the largest in Australia. The trend is amazing. In 1921 the yardings totalled 28,635 head of cattle, 14,837 calves and 10,334 pigs. The figures for 1957-58 were 97,187 head of cattle, 106,376 calves and 68.037 pigs. New modern markets and selling pens are now being built near the railway on the Cheltenham road on 65 acres. The cattle selling section is completed, and the second section for sheep, pigs, calves and poultry is now in hand. The total cost, together with land value is estimated at £ 250.000. DANDENONG will always be a market town. No amount of industrial growth can take from it that atmosphere. Twice a week the farmers of Gippsland still come to it to sell or buy livestock. their wives and families to shop In the fine town that has grown from the market place. The cows have been banished from the town; the whip thong maker has gone long since. Both are pleasant memories of the town that grew from them into Victoria's premier market town and manufacturing centre.